This is one of those projects which has been a long time in the making. 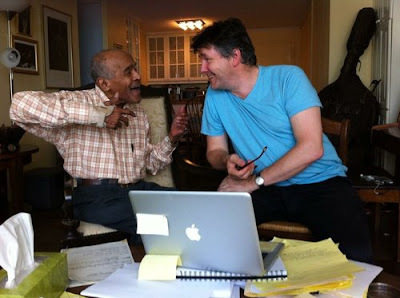 The premiere of Jon Hendricks’ lyricisation of the Miles Davis/Gil Evans album, MILES AHEAD - which will take place at St Peter's Church (the Jazz Church), Manhattan, on Friday 17 February, at 7pm - marks the final fruition of an idea first conceived by Hendricks fifty years ago. Churchill's conscientious work with Hendricks to take the words Hendricks had already conceived and written down or remembered, and to expand them to the point where Hendricks' original ambition - to have full words to the whole album - is complete, has taken several visits. The first partial performance, of three numbers, took place at Ronnie Scott's in June 2014. Mike Collins reviewed it. An ambitious undertaking like this needs supporters. The members of the London Vocal Project themselves provided the original funds for Churchill to spend the time in New York working daily with Hendricks, the Hendricks family have been highly supportive, and the premiere has been thanks to the generosity of Quincy Jones (Executive Producer) and the Jazz Foundation of America. Awesome stuff, best of luck all!